The Indian Ocean lies between Africa, Asia, Australia and Antarctica and, although the third largest of the world's oceans, is one of the most remote places on Earth. The climate is tropical, and the Indian Ocean provides many natural resources such as oil and gas fields. From hydrothermal vent animals to giant tortoises to great white sharks, it's also home to some of the strangest, most wondrous and impressive animals on the planet. Over-fishing of certain species of fish and shrimp, as well as oil and gas drilling, have impacted the habitat of animals in the Indian Ocean and compromised their food sources. There are several endangered species of animals living there. Dugongs, also known as sea cows, are large, solid mammals with paddle-like flippers. Their diets consist primarily of seagrass. When seagrass supplies are short, they'll eat marine algae. Dugongs are often trapped in fishing nets and die from lack of oxygen. Pollution has also killed sea grass beds. The Indian Ocean is also home to several endangered turtle species, including the leatherback and loggerhead turtles. Leatherbacks are carnivorous: their main prey are gelatinous invertebrates, such as jelllyfish. Loggerheads are omnivores and eat a wide range of foods from algae to invertebrates such as shrimp, fish and sea urchins. The discovery of enormous fields of underwater hydrothermal vents in the Indian Ocean led researchers to a wide range of vent animals, including mussels, scaly footed gastropods and anemones. Hydrothermal vents, or hot springs on the ocean floor, are the result of volcanic eruptions. As long as the vents remain active, these animals can thrive. The animals living in these vents survive in darkness and eat bacteria that are able to convert sulfur into energy. Larger vent animals eat smaller animals that eat the bacteria. There are several species of sharks that live in the Indian Ocean. These include the dusky shark, great white shark, whale shark and great hammerhead. 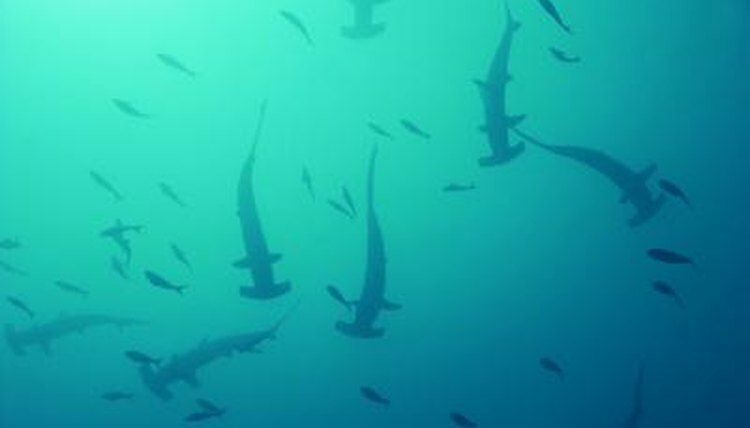 Sharks like the dusky shark and great hammerhead feed on a variety of fishes, as well as on smaller sharks. The great white shark feeds on many marine mammals, including seals, dolphins and porpoises. The whale shark is one of only three species of sharks that filter feeds, or suctions food such as zooplankton through gill slits rather than through its mouth. The species of bottlenose dolphins that live in the Indian Ocean forage on small fish and cephalopods, or marine mollusks. The Indian Ocean is also home to finless porpoises, which eat fish, shrimp and octopuses. The Indian Ocean is home to nearly 28 species of anemonefish, including the clown anemonefish made famous in the film "Finding Nemo." Anemonefish live among host sea anemones. Anemonefish cannot live without their anemones, and anemones are quickly destroyed if the clownfish abandon them. Anemonefish forage on algae and zooplankton, as well as on prey that's caught in the stinging tentacles of its host anemone. Alissa McElreath is a writer and educator based in Raleigh, N.C. She holds an M.A. in creative writing from the University of Binghamton and an M.A. in English literature from the University of Rochester. McElreath's work has been published in "Literary Mama" magazine, on the Family Education Network website and in the anthology "Mama, Ph.D.," published by Rutgers University Press. Where Do the Animals at the Bottom of the Ocean Get Their Food?